Projector lifts are an excellent addition to any home cinema projector installation and offer customers the opportunity to stow their projector away out of site when not in use. 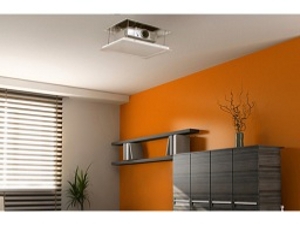 The Lift is installed within the cavity above your ceiling and at a push of button the lift lowers the projector into the correct position and when not in uses raise the projector up into the ceiling cavity. It’s a perfect solution for anyone looking to conceal their technology when not in use for design or aesthetical reasons. AV Installs specialise in ceiling projector lift installation services for the home and also supplies a full range of lifts for sale from all the leading manufacturers. Behind every good installation is perfect planning and finding the correct projector lifting mechanism for your room is the key to success. Our engineers will assist customers in the design stage selecting the correct product and its placement with in the ceiling depending on the structure and available space. AV Installs can also supply and install a range of control options from 12V trigger to RF remote control units or integrate the lift into any existing control system in place. Once the correct lift has been expertly installed and configured AV Installs will then provide a bespoke projector installation service. The projector will be precisely fitted in the lift and aligned perfectly on your projection screen. There is also a range of cable management solutions including our standard service and bespoke hidden cabling services. With the Ceiling mounted projector lift, projector and cables in place our engineer will then connect all your auxiliary devises and tidy up all interconnecting leads. Once the system is configured and running the engineer will give a demonstration of the system and provide any help with technical or operational queries that may arise.